A new report’s recommendation to break up – or privatize – the nation’s veterans’ health care system drew a blast from J. David Cox, president of the union, AFGE, that represents VA health system workers. Cox is a retired Veterans Administration psychiatric nurse. The VA Commission on Care’s “horrendous, anti-veteran proposal…would essentially destroy the veterans’ health care system, leaving millions of veterans without the integrated care they rely on,” Cox said on July 7 after reviewing the report, issued the day before. The report calls the current Veterans Affairs Department hospital system outmoded. It should be replaced by a nationwide network of VA-certified private providers, the panel says. VA Secretary Robert McDonald named the panel after scandals two years ago over treatment. The panel issued its report just after AFGE members held protests in 38 cities on June 30 against its pending recommendations. They based their opposition on knowledge that a substantial minority of the 15-member commission – including two members with ties to the notoriously right wing anti-worker billionaire Koch brothers – was predisposed to privatization. 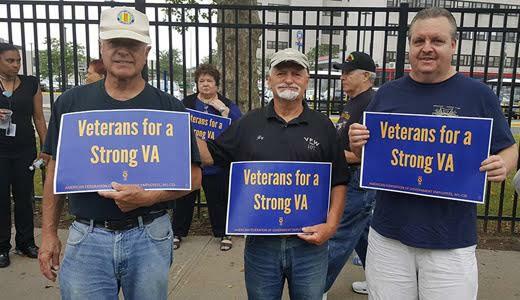 Polls show veterans are overwhelmingly opposed to privatizing the VA. Instead, their main demand is to cure its short-staffing by hiring more doctors. The key passage in the report, buried in its more than 300 pages, declares that “Addressing veterans’ needs requires a new model of care: Rather than remaining primarily a direct care provider, the VA should become an integrated payer and provider. “This new vision would compel the VA to strengthen its current components that are uniquely positioned to meet veterans’ needs, while working with the private sector to address critical access issues. The “VHA (Veterans Health Administration) needs systemic transformation, and merely clarifying and simplifying the rules for purchased care is not sufficient to achieve that goal. VHA must replace the arbitrary eligibility requirements and unworkable clinical and administrative restrictions of current programs with the new VHA Care System, available to all enrolled veterans,” it states. Together with specialized treatment only VA can provide – for post-traumatic stress disorder, brain injuries and the like – veterans could use “integrated networks to deliver high-quality and high-access care…across the United States,” the commission claims. “The most egregious recommendation in the report would dismantle veteran-centric care through the vast expansion of costly, for-profit provider care. The VA provides veterans the best health care in the country, something acknowledged even by this biased commission. “Yet they want to push veterans out the door to lower quality, for-profit providers who will inevitably offer inferior care. As it stands now, only 13 percent of mental health providers in the private sector are properly prepared to treat our veterans. “Veterans will not be helped by having inferior care at higher costs. It is far better for veterans and taxpayers to invest in the only system tailored to veterans that is already proven to be better and has already made vast improvements. “Today veterans can walk into any VA hospital and receive seamless access to the integrated primary medical, behavioral, and specialty care provided by a system that specializes in their care. “This includes support systems offered at the VA through financial, educational, housing, and employment support. Destroying this system in favor of fragmented, for-profit private providers creates dangerous gaps in treatment and missed opportunities to heal veterans,” he said. The report now goes to McDonald, named to the post in the wake of the scandals. But it also heads for Congress, where some of the ruling Republicans – especially some on committees that oversee government worker issues – are highly partisan pro-privatizers. But VA privatization has another foe: President Obama. He told the Colorado Springs Gazette in June that he opposes the idea. Privatization would delay future VA progress, Obama added.